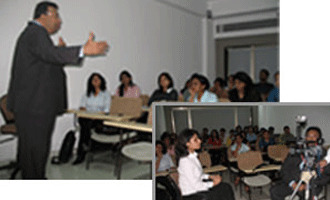 Ravi Shyam, CEO - Media Training Worldwide, India conducted a two-hour 'media training' workshop. This practical session shed light on various aspects and fine points of facing the media. Advertising students from MET Institute of Mass Media received practical tips on functioning as Senior Corporate Managers in an organisation. Mr. Shyam elaborated fundamentals of facing media and demonstrated using a video film, live recording, video playback & role play.